Interior design by Karen Mills. Photography by 29 Pixels. DesignerInc just did a Designer Spotlight interview with me today and wanted to share it with you! Absolutely love interior design and working as an interior designer but if you knew my heart you would know my top priority is helping people make things better – increase their joy through forgiveness, help navigate life changing choices, or by simply creating an extraordinary living experience. One of our favorite things about working with interior designers at DesignerInc is taking a moment to pause and revel in their work. There are so many talented designers on the site that it’s hard not lose hours perusing their portfolios once you learn of them. Our latest discovery was Karen Mills and her firm Interiors by Design. You may have heard of her, as her work has been featured in over 100 media outlets including USA Today, Elle Decor, and The Washington Post. When she’s not designing, she’s the host of nationally acclaimed Living Large, the first design and lifestyle radio program in the US. And if that wasn’t enough, her award-winning blog was named to one of the Top 100 Interior Design Blogs. It was there that we learned a few tricks of her trade. Her blog offers many useful design tips such as how to deemphasis mismatched upholstery, reimagine a walk-in closet into a glam dressing room, design a basement that lives and breathes like the rest of house, or strike the right balance of drama in the dining room. With her wealth of knowledge, it’s easy to understand how she’s become a go-to design expert in the media and a spokesperson for Kohler, Sherwin William, and Ferguson. We love her skill of blending and layering textures. 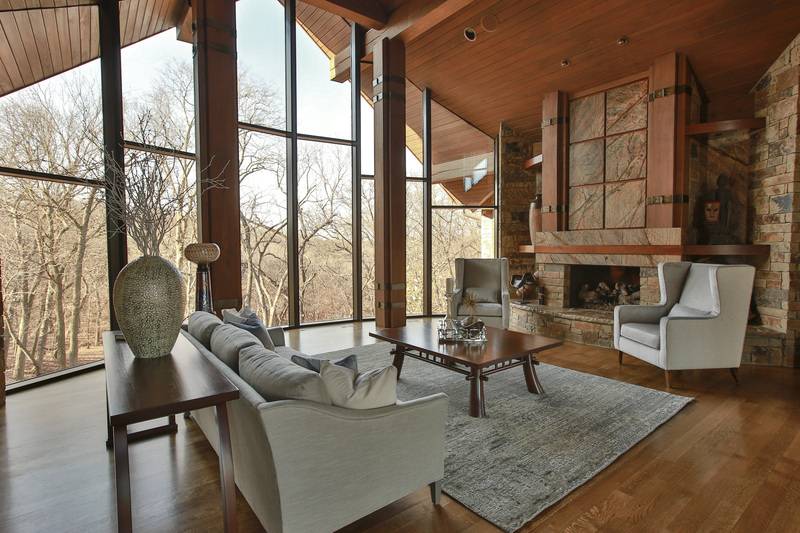 In this mountain home living room, she balances a soft cool palette to enhance the warmth, color, and tone of the natural elements of rock, wood, metal and leather. Or how she strikes the right amount of symmetry in this plush master bedroom that gives structure to various textures and materials in the room. The best part about being a designer are relationships forged with clients, as we translate their personal style into a timeless signature look that helps reduce stress, nurture their soul, and help them live better. The result is an extraordinary living experience, which often brings families closer together and creates a lifelong connection between us and them. I would keep asking until I found a mentor in the design field before launching our company, along with getting advice offered to start ups from the business development center. My favorite resource would be a mix of local tradespeople who help bring our visions to life and to-the-trade designer-only showrooms, both online and local. We loved getting to know Karen and her work better. Look out for more Designer Spotlights coming soon!